We have finally made it to 2017, and what better way to greet the new year than with the master of explosives, Sabine Wren? I talk a lot about the main purpose of costume being narrative. Its purpose is to convey character – if a costume doesn’t outwardly say anything then it should be obfuscating that character’s story on purpose. Sabine’s design is the very essence of wearable narrative. Ready for action, Sabine is armoured in her own history and life. 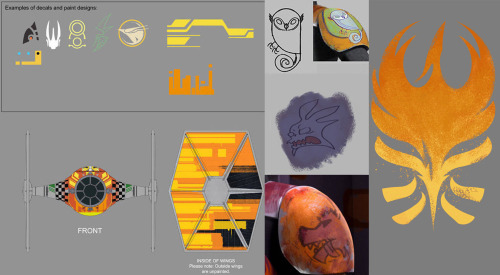 Sabine ‘spirit of’ designs, S1-3, by Killian Plunkett. This with the radically pared down armour communicates both her agile combat style and her status and expression as a young woman. The concept of taking a garment or fashion of tradition and twisting it, reinventing it and owning it has been a key foundation of a number of youth-led movements in the twentieth century, in particular the miniskirt revolution of the 1960′s which politicised skirt length and challenged gender norms and expectations. Mary Quant, the inventor of the miniskirt in her King’s Road shop stated that it was femininity in ‘attitude rather than appearance.’ Much of this then fed into certain area of the punk movement of the 1970′s, which challenged a bourgeoise, over-indulgent culture in response to dissatisfaction with a country in crisis. Punk is notorious for it’s appropriation of tartans and plaids, dogtooth weaves and flag imagery. Tradition bound in leather, studs and rubber. Aspects of both of these movements fed into the New Romantic movement of the ‘80′s, and the Riot Grrl subculture of the ‘90′s. Each of these movements used aestheticism and fashions to communicate issues of identity and philosophy. L: Plastic chainmail miniskirt by Paco Rabanne, 1966. 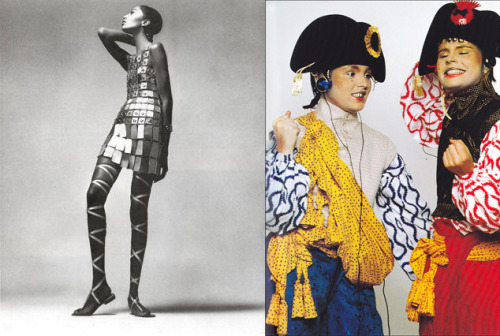 Rabanne’s 1966 futuristic collection of geometric shapes sought to challenge haute couture with architectural shapes. R: Vivienne Westwood’s Pirates collection, 1981. Westwood was heralded as the ‘mother of punk’ before moving on to New Romanticism in 1981. Her collections typically include historical cut and patterning subverted through atypical construction and textiles. This fusion of tradition and radicalism is at the heart of Sabine, a young woman fighting a tyrannical power day to day and steadily moving into a position to challenge the broken, scattered Mandalorian system. In her armour Sabine retains the diamond shapes of her people, the fundamentals of the uniform of Death Watch but boiled down to its bare essentials and then decorated it with her personal identity. History of self and community fused. This is more significant when considering that the armour of Death Watch in itself hearkens back to a more violent time when every Mandalorian was a warrior. Sabine is a warrior artist, expressing herself in her art, style and fight. Don’t let the decoration on the armour fool you, she’s a Mandalorian. She’s a warrior. She was trained in the ways of Mandalore. She’s a munitions expert, she’s extremely smart… What makes her more special is that she’s an artist: she’s blowing things up, she’s getting the job done but she’s doing in with flair and panache she’s setting of these explosions, but making them beautiful. 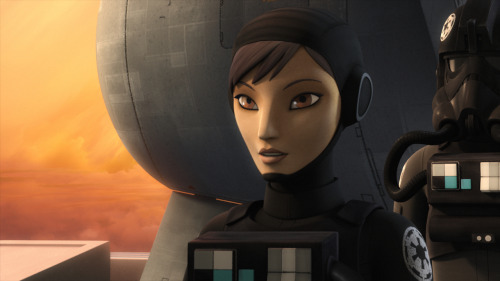 Sabine undercover as an Imperial Academy cadet in The Antilles Extraction. Restrictive and confining with no colour, no individuality. Even her hair – dyed back to her natural colour – is hidden and confined as she blends perfectly with her equally anonymous fellow-cadets. Sabine’s response to an existence in this identity-less life is through colour and expression. 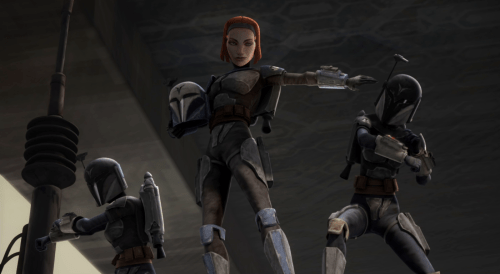 Bo Katan’s Nite Owls in The Clone Wars, a part of Death Watch. Death Watch armour was kept relatively uniform and muted in The Clone Wars in order to avoid a visual overload and lend the strength of an organised militia. Blues, charcoals, greys and dirty white highlights were used in various combinations, detailing such as Vizla’s cape and the pop of colour in Bo Katan’s hair subtly indicated key characters. Gar Saxon turnaround from Imperial Commandoes. Heavy angular armour more akin to stormtrooper armour echoing rather than replicating those traditional mandalorian lines. Colour is minimal and stark, used to highlight commanding figures. 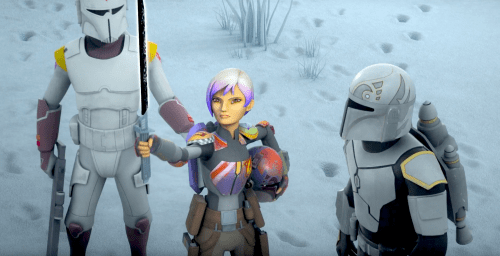 Sabine with an Imperial Commando and member of the new sect of Mandalorians introduced in the mid-season 3 trailer. These new Mandalorians wear the traditional Mandalorian armour, but in white and grey tones with yellow highlights as it has been stated that they are also loyal to the Empire (to what extent, however, is unknown.) 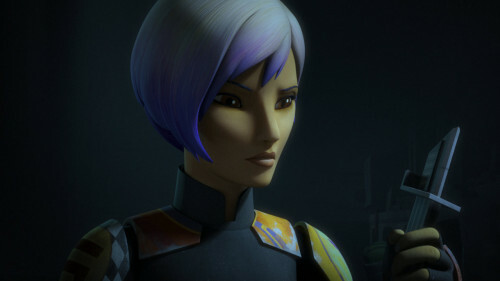 Sabine is a radical burst of colour between these two factions. Note this Mando’s helmet markings which are the same as Sabine’s. It is interesting to consider that Sabine’s primary colours are purples and pinks, both of which were previously worn by Satine Kryze. I was just doodling it out. I based the helmet design on a barn owl, because my wife loves owls. So it’s kind of based on the white ghost face of a barn. This bird motif continued into Son of Dathomir in a more literal manner, giving Rook Kast a winged helmet. Rook Kast was a Nite Owl that defected with Maul after Vizla’s death. (The pairing of the imagery with the bird name is no mistake, either. After all, this is Star Wars.) Sabine’s helmet retains the narrow ‘barn owl’ shape of the Nite owl and the wings of Rook Kast’s albeit painted. Thanks to the mid-season 3 trailer, we now know that this design is shared with another group of Mandalorians led by a woman who shares the helmet and armour of Rook Kast. L: Bo Katan. C: Rook Kast, almost certainly Sabine’s mother, in Son of Dathomir. R: Sabine S2 helmet turnaround. The Rook and the Wren. 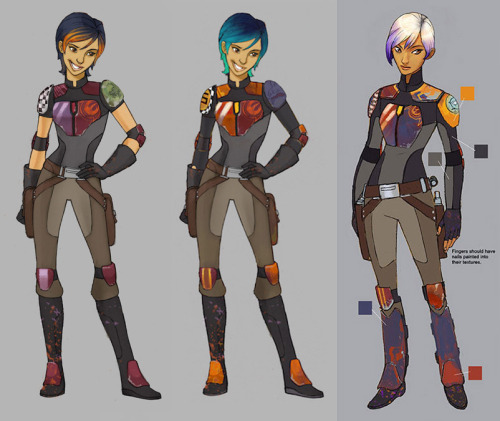 Sabine has had one of the most significant evolutions in her look over the course of Rebels, developing from a teen girl to a strong young woman. Her costume has retained the same basic look throughout, but there have just enough shifts to push her growing maturity: the most obvious sign of this is her sleeves which have literally grown from short impractical sleeves to long sleeves, to panelled and (presumably reinforced sleeves. )Likewise, her armour has elongated pushing closer towards the more traditional Mandalorian chest plates, retaining that minimalism whilst adding more protection. Pauldrons and neck pieces are wider, flatter, closer to the body. This also works neatly with the overall push in Rebels towards the ‘70′s aesthetic of ANH whilst retaining Sabine’s vibrant contemporary relevance. Like the rest of the crew, she wears short gloves; her greaves feel like a fun nod to flares of the 70′s whilst, once again, offering protection. There is a sense that everything fits better to her body as she has grown into herself; as Sabine has reworked her evolving priorities and needs. With her more refined hair and unified colour palette, the overall look is more sophisticated and strong. There is a stronger fusion of the different facets of her life and history, rebel and mandalorian, artist and warrior all unified within herself. Through her possession of the darksaber and part in wider machinations, she is being thrown into a place of responsibility and leadership that she has never been willing to consider before. A position that has destroyed many before her – Vizla, Satine, Maul, arguably Rau – but because of her many internal and expressed dichotomies, she is in a position to make progress. 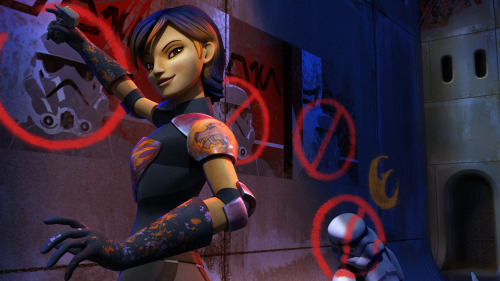 Sabine is both new and a product of legacy.